Two days ago, Chile’s Calbuco volcano erupted for the first time in over four decades. It spewed an ash cloud nearly 10ten miles high, resulting in evacuations within a 12-mile radius around the volcano. Here’s what the action looked like from space. For a period of about 90 minutes, Calbuco violently ejected ash and pumice into the sky. Lava flows were also observed from the main vent. A second eruption occurred yesterday, and there are now fears of a third. Thankfully, there have been no reports of casualties so far, but some 1,500 to 2,000 people had to be evacuated. 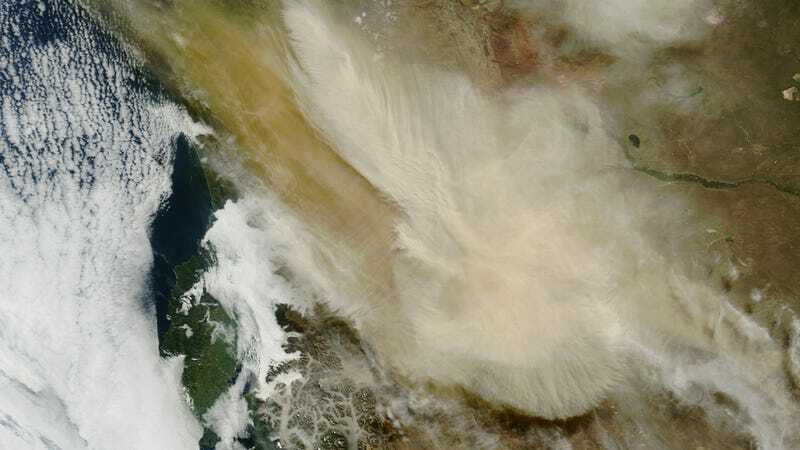 The MODIS imager onboard NASA’s Terra satellite captured this image (above) at 11:20 a.m. local time on April 23rd. Notice how the plume has moved in a northeasterly direction. Below is an unannotated version of the image. Four hours later MODIS captured another pic (below). Terra wasn’t the only satellite to witness the action; the VIIRS sensor onboard the Suomi NPP satellite actually managed to capture mesospheric gravity waves associated with the eruption. Also known as “airglow waves,” they appear as faint concentric ripples in the mesosphere (below). VIIRS also captured this heat signature of the plume. Image credits: Joshua Stevens, NASA Earth Observatory, and Jeff Schmaltz, LANCE/EOSDIS Rapid Response at NASA Goddard; VIIRS images courtesy of William Straka, SSEC.